Looking back at the history of the boat shoe, it’s clear why this practical footwear style eventually made it into popular culture. Also known as deck shoes or topsiders, the canvas or leather, rubber-soled styles were first invented in 1935 for modern boaters, loved for their highly durable designs that repelled water and didn’t slip. 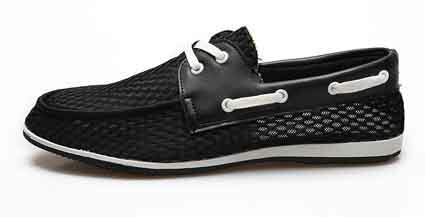 Today, they are as fashionable on shore as they are off shore with a range of men’s high end fashion loafers and smart shoes on offer. The most unique styles come courtesy of FÅNE Footwear, offering comfort, durability and reliability fit for any occasion from the formal to casual. FÅNE‘s design appeals to those with an eye for fashion and practicality, without putting a dent in the wallet. We took five with FÅNE footwear director, Fane Levy to chat further on the history behind the brand; European inspiration trips; and the future. I’ve always been one for fashion and a guilty shop-a-holic. But more-so, highly entrepreneurial and driven. I was in search of a good pair of loafers without the hefty pricetag. I searched the global web and a list of contacts I had made over the years and ordered a few pairs. After rummaging through the tacky and cheap stock, in October 2011 (exactly 1 year ago) I stumbled upon my original “Flap (Suede) Light Grey Loafer. I wore this for several weeks and opened conversation with the manufacturer. I had an epiphany to turn this shoe into a brand label with my design input and strong marketing and sales skills. I partnered up with a financier and began ordering samples. Over the course of six months, I went through over 10 shipments of samples having to improve each batch. First the soles were an issue, then the laces, sizes, branding, width – you name it. After thousands of hours of design tweaking I landed my first shipment of FANE Footwear in the first week of August 2012. I live by the rule, “Go hard or go home”. Having said this, my first order consisted of over 700 pairs, just under 1 tonne worth of stock. I then built the website, business cards, set up meetings with retailers and promoted the brand heavily through my facebook following and close friends. To date, I am currently stocking two stores, four online websites and my direct website www.fanefootwear.com.au. Sales have been doing well and the brand is gaining traction. I hosted the official FANE Footwear launch party last month at Hugo’s which received a turnout of just under 200 people. I source my inspiration from the current trends in Australia and globally, namely Europe. I love the European lifestyle, culture and fashion. It’s second to none. I could definitely see myself living in Europe one day. Television, music videos, magazines and internet blogs drive my influence also. Sending out images of trends and guaging people’s response is a solid means of driving my designs. This points me in the right direction with new styles. I have a simple business plan. I keep to a minimum range of styles (currently six), but alter the design and feel of the shoes through colour. I believe colour is the most essential part to any item. Without colour you are left with a blank canvas, a silhouette. I cut out my colour cards and mix and match the colours to transform the shoe from one design to another by simply alternating the colour and contrast. At present I offer suede, leather, nuback and patent loafers. My boater range is one simple style with four colours. It’s quite simple. My name is FANE LEVY. As a child I hated my name as it was so different to everyone elses. As time went by my frustration grew with people not being able to understand what my name was in person or over the phone. Having to repeat myself several times and eventually succumbing to answering to Dane, Wayne, Shane, Zane and the list goes on. As I matured I grew to love my name and appreciate its uniqueness rather than difference. I decided this could be a unique name for a fashion label, this way people will recognise the name should the brand take off. My range of waterproof boat shoes are currently in production and will arrive in two weeks. I see these as being a huge hit for summer, the beach, boat parties and everyday wearing. Should these take off, I will introduce a larger colour palate. I will be moving into women’s loafer/flats and some clothing items also, but that’s still to be confirmed.